When I asked the question in an earlier post whether a work of art bore the "genetic" imprint of the artist, I thought of Robyn Gallimore of Red Bird Knits. 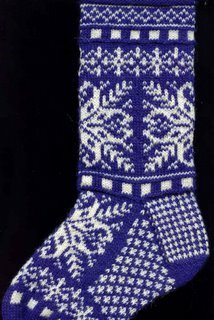 Robyn is a sock knitter and a phenomenal sock designer. She has a sock of the month club and so designs a new sock every month. The club has been going for more than 3 years that means more than 36 sock patterns WOW!!! and I thought that I had trouble with math. I once commented to Robyn about one of her new designs. I had noticed a sequence that was repeated every now and then in a new sock here or there. I said that this was her signature. Take a look at Robyn's socks and see if you can pick it out before you read on. If you picked out the little row of small blocks - you're right! I called Robyn the other day and asked her if she could explain why she often used this sequence. Of course I called just after 9:00 in the morning - I'm a morning person and Robyn is a night person - well you know how night people just hate morning people - they're the ones who sing, make jokes an slap you on the back before you've had your morning coffee or maybe even while you're actually drinking your morning coffee. In a voice that said - get lost, Robyn said that it might have had something to do with math. Now Robyn has no trouble with math - she majored in it at university, thought about taking actuarial science and well, on a bad day, I still count on my fingers and have trouble both saying and spelling actuarial and I majored in English. She e-mailed me back, this is 9:30 a.m. (why virtual afternoon for a morning person) - My mother studied music - organ, my great grandfather played the Cello and my grandfather played the violin...yes music has timing and rhythm and I definitely can see a musical theme repeated with the various "passages" of the sock. 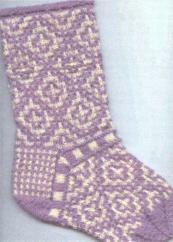 There are stitches in the cuff which are echoed in the turn of the heel. Often the instep is a small refrain of the upper part of the sock...but the dance...tell me about the dance....no answer. I blew it - no more e-mails, and just voice mail, when I called...It was just too early in the morning to think seriously about anything! So I went back to Robyn's sock patterns. I noticed that there were 5 or 6 socks with references to dance or music in their titles. I also saw lovely dancing piris in many of the fair isles. Some socks had stately quadrilles of cables and ribs, while others had quiet pas de deux passages of knit and purl. There were arabesque patterns in lace and spritely slip stitch motifs. Not to mention the lovely diagonal sashays and the sensuous curving tangos. All phrased within the sonata of the sock! So much of the art of dance and music.... for a sock!... click, click, click...ooops I've just lost a good number of sock knitters. I only say this because a knitting friend once said to me that she never knit socks, - "Why spend all that time and money for something that is just going on your feet." Why in deed? There is something to be said about feet that dance, even just figuratively. There is something about the uplifting of the spirit, about the energizing of the body, about the restoring of the soul (not sole). Why not create something very sublime for your feet! 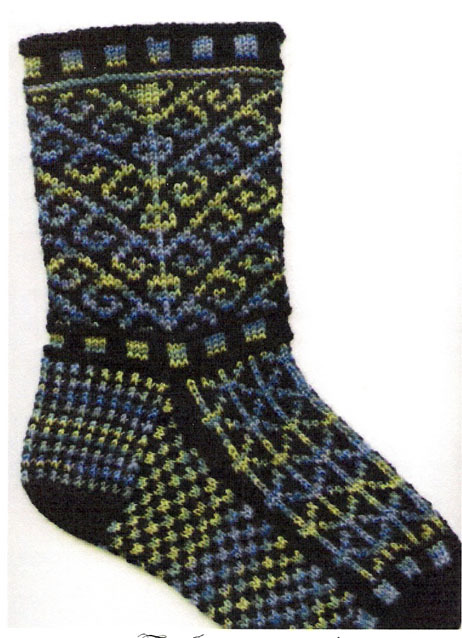 "Socks are a compact piece of art - easily done, quickly finished and wonderful to wear. Can never go back to wearing commercially knit socks. Instant gratification for your feet!" Robyn's patterns and kits are available from her website. Also the place to join her sock of the month club. P.S. We have a winner in the Robert Burns posting. I'll save the details for another post. You have to read the poem; enjoy the comments and know that we have a most scholarly following in this weblog. And some people think that knitting is all about rocking chairs.. well maybe "ROCKING" chairs!!! P.P.S. Robyn e-mailed with a note on an oversight or two in this post. She says that she is a Cellist-not a concert Cellist. Well she plays the Cello in concerts. (Is this like a Viola joke?). Also Robyn points out that she thought of taking Economics and Finance, not Actuarial Science - now who was it that was going to study Actuarial Science?...maybe I should try sleeping in longer!